This is a less viewed angle on the Mule Ears formation (outside the national park), which is most commonly viewed looking East from the Terlingua big porch at sunset. This day, I was searching for the remote “Moon Valley” section, and as the sun rose, I stopped to enjoy this view. Add tags for "Mule Ears dawn.". Be the first. 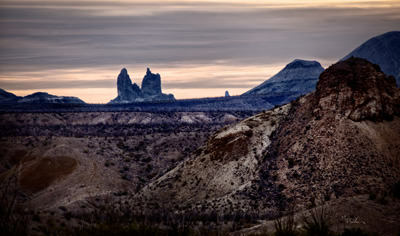 <http://www.worldcat.org/oclc/889660903> # Mule Ears dawn. schema:about <http://www.worldcat.org/oclc/889660903> ; # Mule Ears dawn.